Mike Trout has tied Vernon Wells for career Wins*. Wells has five-thousand more plate appearances than Trout. Eight big league batters have posted a .450 On-Base Percentage since the 2013 all-star game. To little surprise we have Mike Trout, Yasiel Puig and Joey Votto among the elite hitters. There are more interesting names among the leaders. Of course this is a small sample size (3 weeks of games), but I want to give Astros, Mets and Cubs fans something to be happy about. Once upon a time there was a young Angels outfielder who had a dynamite offensive and defensive season. 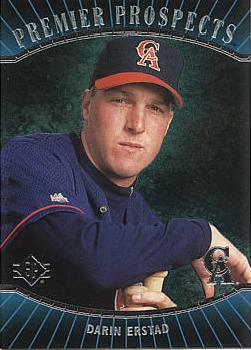 His name was Darin Erstad and the year was 2000. His WAR was a spectacular +9 (just one win behind Mike Trout‘s legendary 2012). Their stats above are pretty comparable. Erstad batted 29 points higher with more doubles but Trout walked more, stole more bases and supplied more home-run power. They were each clearly the best fielders on their team and both deserved gold gloves. Also they were both managed by Mike Scioscia (Erstad in Mike’s first big league season as skipper). Baseball people project Trout to be an all-time great and rightly so. Unfortunately there is always a chance that he could peak a bit too early like so many projected greats have before. Let’s hope not.